An egg omelet is delicious for breakfast or any meal. Your taste buds will relish the flavors of a plain cheese omelet or add veggies with bacon, sausage, or ham already cooked. It’s simple to make in about 20 minutes serving 6 people a generous portion. A cheese omelet with veggies and meat will kick-start your day at any hour that is healthy and nutritious with protein, vitamins, and minerals. 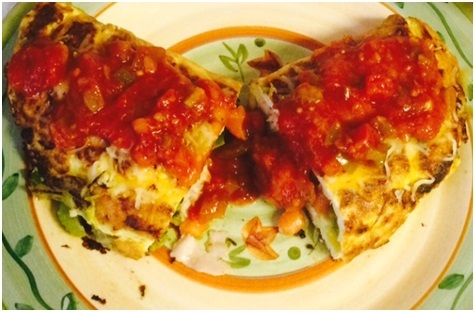 Cover the firm omelet with chunky salsa for a spicy taste treat. In the meantime, beat the eggs and half-and-half or milk, salt, pepper, with a whisk until well blended then add bell peppers and onions. When the butter is hot, add the egg mixture. Top with your favorite cheese of cheddar, jack, American, etc. On the top of the cheese, add cooked bacon, ham, sausage, or all of them for meat lovers. Cook over low heat covered. When the cheese is melted to the center, fold the omelet over with a non-metal spatula. Let it cook about 3-4 minutes then flip to the other side for another 3-4 minutes. Top with salsa. My favorite brand is Herdez® being chunky without much tomato sauce. Serve with toast or warm tortillas adding avocado and fresh sliced tomatoes if desired with sour cream on top. 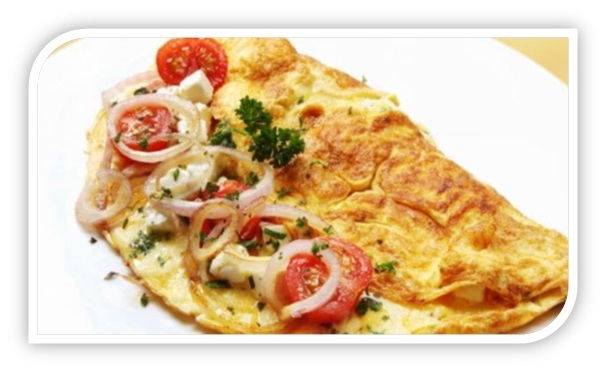 Enjoy your cheese omelet with veggies and meat and relish in the flavors.